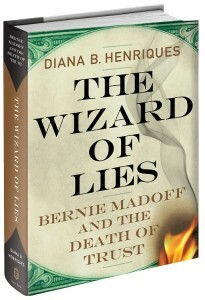 In The Wizard of Lies which will be published tomorrow, Diana B. Henriques of The New York Times–who has led the paper’s coverage of the Madoff scandal since the day the story broke–has written the definitive book on the man and his scheme, drawing on unprecedented access and more than one hundred interviews with people at all levels and on all sides of the crime, including Madoff’s first interviews for publication since his arrest. Henriques also provides vivid details from the various lawsuits, government investigations, and court filings that will explode the myths that have come to surround the story. The New York Times recently published a lengthy article adapted from The Wizard of Lies. You can read that article here.